Suffolk County Crime Stoppers and detectives from the Riverhead Police Department are seeking the public’s help to identify and locate two people who stole merchandise from a store in Riverhead earlier this month. Riverhead, NY - October 25th, 2014 - Suffolk County Crime Stoppers and detectives from the Riverhead Police Department are seeking the public’s help to identify and locate two people who stole merchandise from a store in Riverhead earlier this month. 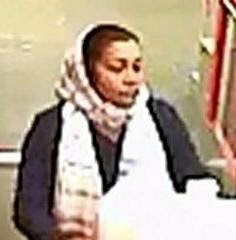 A man and a woman entered Target, located at 1150 Old Country Road, on October 11 at approximately 9:10 p.m. and stole 19 sets of headphones, a cooler and a body pillow. The suspects, who were described as Hispanic, exited the store without paying. They were seen leaving in a red SUV. Subject: LongIsland.com - Your Name sent you Article details of "Couple Wanted for Shoplifting from Riverhead Target"